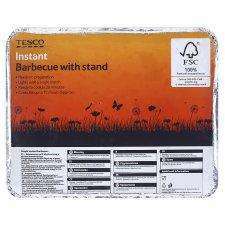 Price glitch: Disposable BBQ £0.60p (were £3) @ Tesco - Instore and Online! Tesco decent quality disposable BBQ's for 60p! £2 in ASDA and the ones in poundland are far inferior as no doubt others will post, however these are far cheaper now at 60p - down from £3. BTW these come with a stand - others, incl. ASDA's dont. These noramally go on sale at the end of season, but to be able to stock up with these at this price at beginning of summer is brill! Update: This is a price glitch. Were supposed to be £2.40, 60p off £3. Some stores actually have that on the shelf, but it scans through at 60p. Update : Search the forum. This seems like a mega glitch in the garden dept. many items are scanning through at their 'reduced by' price. oh no- ive just paid £2 at asda. It's entirely possible. They put fuel on the charcoal to help it ignite. The way around this though is to let it burn off, you shouldn't be putting your food on until the coals have got going anyway. I bought 5 at that price last week... But I just got another 10 at Tesco's for this price. A long summer ahead. Coals are impregnated with some type of flamable substance so it light without problems. You need to leave it for about 15- 20 mins till the coals are white, by then no smell of it - just the smell of fire :-). Mind you that goes for all BBQ's, you dont grill when there is still a flame. Hope they have some tomorrow morning. These are cheap! !Hope they have some tomorrow morning. Does anyone know if these are allowed at music festivals? T in the Park to be specific. Son is going there next month and these would be ideal. Seen this and popped into my local Tesco - they had pallets of them but they weren't 60p - the offer was 60p off which brought them down in price to £2.40. Since posted, have been online and can buy them to be delivered by the same store at the price of 60p - only difference is they stung me for a £3.50 delivery charge - ordered 10 so they only cost 95p each. Are these ones any good? Some of the disposable ones are rubbish. The Lidl ones are cheap and a complete waste of money as the grill sits directly on the coals and burns the food badly. Are these ones any good? Some of the disposable ones are rubbish. The … Are these ones any good? Some of the disposable ones are rubbish. The Lidl ones are cheap and a complete waste of money as the grill sits directly on the coals and burns the food badly. I've found Tesco ones to be better than Morrisons and Sainsbury's. It's obviously not as good as a proper BBQ but cooks food well enough. Lasts about an hour, an hour half I think, don't remember. Good find. Great price.Does anyone know if these are allowed at music … Good find. Great price.Does anyone know if these are allowed at music festivals? T in the Park to be specific. Son is going there next month and these would be ideal. Says they're not allowed at all! Some festivals I attended last year allowed only these small disposable ones and had to be used in the fire lanes away from tents. http://www.tinthepark.com/content/default.asp?page=s5_3Says they're not … http://www.tinthepark.com/content/default.asp?page=s5_3Says they're not allowed at all! Some festivals I attended last year allowed only these small disposable ones and had to be used in the fire lanes away from tents. Just picked up a couple at Tesco Weston-Super-Mare and as said they say 60p off but scan as 60p. cheers just filled mi boots!!!! Just got 4 at Cumbernauld. Says £2.40 on the bulk stacks at end off aisle and front door, but in the seasonal aisle the shelf label for them says 60p and they scan at 60p. Most of the Barbeque equipment was glitched..
Did see a £50 two burner gas BBQ with £7.00 but was too timid to try that one out!! Sounds like the Tesco head office pricing team had a bit of mare today! I'm afraid, some new guy in the data input dept. is gonna lose their job tommorrow. I'd imagine there are a few fields on that pricing screen 1 where the original price is entered one where the reduction and one for the final price and someone has entered all the reductions to final price.... Not a very good first day for Johnny! Online link above, got 5 at 60p each! … [url=http%3A%2F%2Fwww.tesco.com%2Fgroceries%2FProduct%2FDetails%2F%3Fid%3D265523563]http://www.tesco.com/groceries/Product/Details/?id=265523563[/url]Online link above, got 5 at 60p each! Yh, that's where the 'go to deal' takes you anyway. Have you got the SKU or barcode for that Chimnea please?